The Texas cities of Beaumont and Port Arthur were watery wastelands Wednesday after they felt the wrath of Harvey. The storm finally weakened to a tropical depression Wednesday evening, but not before it swamped the cities with a record 30 inches of rainfall, unleashed flash flooding that police said killed two people in Beaumont and forced hundreds of residents to flee to local shelters. For many, there was no escape from the water. 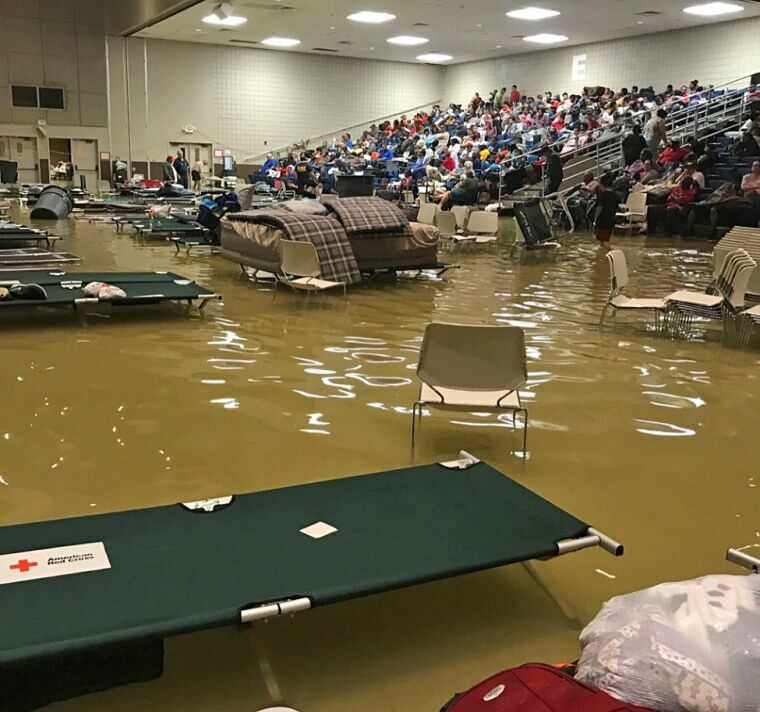 NBC affiliate KBMT of Beaumont reported that the Robert A. Bowers Civic Center in Port Arthur was flooded. Pictures posted by the station showed evacuees lying on cots surrounded by a sea of water. And many of those storm refugees wound up being sent to another shelter in the city. Similar scenes were repeated up and down the Gulf coast in the aftermath of Harvey, which struck Texas on Sunday as a Category 4 hurricane and is now blamed for 28 deaths, including those of a Houston family of six who perished when their van was swept away by floodwaters. About 30,000 Texans on Wednesday were huddled in 230 shelters, and nearly 200,000 people who lost their homes and possessions to the storm had applied for federal assistance. Brock Long, administrator of the Federal Emergency Management Agency, said the agency had more than 12,400 federal personnel from 17 agencies already on the ground to help local law enforcement and first responders. He said temporary refuges had been found for about 1,800 people in hotels and motels on higher ground. But thousands more need help, and Long said FEMA was working around the clock to get everybody to safety. "This is going to be a frustrating and painful process," he warned. Texas Gov. Greg Abbott said there were "30,000 beds that are available for sheltering as needed." "The worst is not yet over for southeast Texas," Abbott said. "Flooding conditions will continue to be a challenge for people in the area." Abbott also swatted away false reports that people showing up at shelters were being asked to produce their papers. "No one is being asked about their status," he said. The National Hurricane Center described the flooding in southeastern Texas as "catastrophic" and "life-threatening." Port Arthur Mayor Derrick Freeman warned those menaced by flooding to seek higher ground and to stay out of attics to avoid being trapped by rising water. He said help was on the way. "If you called, we are coming," he said. Port Arthur, the hometown of the late rock great Janis Joplin, and Beaumont were pounded by rain before Harvey made landfall again, doubling the previous record for one day of rainfall in the area, according to The Weather Channel. "Many Texans in and around Beaumont [and] Port Arthur are fighting for their lives against an incredible amount of water," NBC News Meteorologist Bill Karins said. "This is just as bad, if not worse, than flooding in Houston." The cities are around 100 miles northeast of Houston near Sabine Lake and the Neches River. "Our whole city is underwater right now," Freeman said in a Facebook post earlier Wednesday as distressed residents posted addresses and phone numbers on his official page and pleaded for help. "We're stuck in the house, six kids, one adult mom is disabled and oldest child is on medication ... water is knee high in the house and about 10 inches or less away from the wall power outlets," a resident posted on the page. In Beaumont, police said a toddler suffering from hypothermia was found clinging to her drowned mother in a flooded canal a half-mile from her car late Tuesday. Police identified the woman as Colette Sulcer, 41. The girl, whose name wasn't released, was listed as stable. Appearing on NBC's TODAY, Beaumont Mayor Becky Ames warned that once the water recedes, there are likely to be "some more horrible situations, because we do know it's pretty bad out there." Pictures from the city showed dozens of submerged cars — clear evidence that many people ignored warnings that the roads weren't safe to drive on. "Every single body of water" around Beaumont was "at capacity and over flowing," Ames said. "The rain is still coming down." And the devastation to Beaumont, Ames said, is "like nothing I've ever seen before." Port Arthur is home to the largest crude oil refinery in the United States, and that operation, run by Motiva Enterprises, was shut down by the storm and the flooding, officials reported. It wasn't immediately clear whether the facility sustained any damage or when it would be up and running again. Meanwhile, Abbott has deployed the entire 14,000-member Texas National Guard to the 45 hardest-hit spots in the state. And he dispensed praise for local law enforcement, first responders and all the regular Texans who "really stepped up." "I applaud them all for going above and beyond the call of duty," the governor said. But Abbott also issued a warning to people who hope to profit from the misfortune by jacking up prices of gas, food and shelter. "Price gouging is not only reprehensible, it's illegal," Abbott said. "It's un-Texan, and we will not tolerate it." In a sign that life in some parts of south Texas was returning to normal, flights resumed Wednesday afternoon on a limited schedule from Houston's William P. Hobby and George Bush Intercontinental airports. "We have heard from many fellow Houstonians who are anxious to return home to assess their circumstances following the storm and to join our recovery efforts," Houston Mayor Sylvester Turner said in a statememt. "Our airports continue to provide a critical link to humanitarian efforts, to the military and to a world willing to support the tough task of getting back to normal." After pounding metro Houston, Harvey made landfall again early Wednesday, coming ashore in western Louisiana near the Texas border. Kevin Roth, a senior meteorologist for The Weather Channel, said the Beaumont/Port Arthur area had gotten about half a year's worth of rain in one day. "Small creeks and small rivers and streams are the first to flood. Then the other larger rivers in the area will begin to swell," Roth said, explaining the flash flooding process. Roth predicted that the rain would begin to taper off in the area around sunrise as the center of Harvey shifts position.